The 10th International City Management Symposium in Camagüey focused on ensuring sustainable urban development. CAMAGÜEY.—Achieving a model of sustainable urban development, in response to the rapid pace of changes taking place in historic city centers today, was the theme of the thirty papers presented by experts and researchers during the 10th International Symposium on Challenges in the Handling and Management of Cities. Dr. Gina Rey Rodríguez, 2015 National Prize for Architecture winner, speaking on the final day of the event, held at the Santa Cecilia Convention Center, referred to the need to introduce advanced urban management models which prioritize environmental protection. She noted the complex challenge presented by the need to restore historic city centers, as part of a process to protect architectural, historical and cultural heritage, while ensuring a focus on endogenous development, local innovation, resources and projects, as has been seen in certain municipalities of the island. The expert provided examples of how strategic planning can incorporate essential elements for the protection of the urban ecosystem, including habitat improvement, the use of renewable energy sources, integrated management of waste recycling, urban agriculture and the balance between green spaces and built-up areas. In the context of the 10th Symposium, the Cuban Network of Historian and Curator Offices of Heritage Cities also met, with guest representatives from Baracoa, Sancti Spíritus, Matanzas and Remedios, where institutions of this type are currently being established. 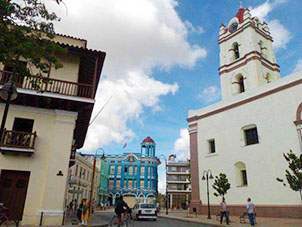 During the exchange, the experience of the local guidance and consultation office of the historic center of the city of Camagüey was presented, a project that aims to ensure compliance with urban regulations in both the private and public sectors, in accordance with current city plans. One of the key features of this event is that it provides both a space to outline specific problems from the academic or scientific perspective, and to offer strategies, projects, concrete solutions and best practices to meet the enormous challenges of urban centers today. On concluding, José Rodríguez Barreras, director of the Camagüey City Historian’s Office, provided details on the next Symposium, scheduled for 2017, which will focus on the impact of economic development on historic cities, to which he extended an invitation to experts and researchers from Cuba and beyond.